Chinese authorities can subject Chinese citizens to forced abortions, forced evictions, forced labor, and forced organ harvesting. Now there is forced cremation. A new law in China’s Anhui Province stipulates that after June 1, people will be cremated when they die; burials are no longer allowed. Six senior citizens in Tongcheng City, near Anqing, have committed suicide in May to make sure they would be buried in the ground before the new policy became effective, Beijing News said. Family members all said the reason for the suicides was to avoid the cremation policy. 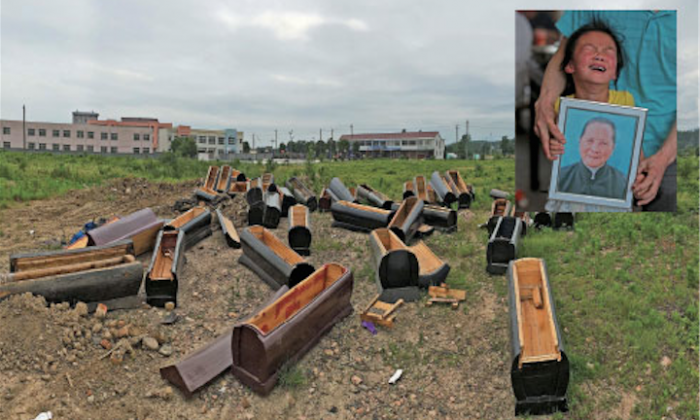 Wu Jianqing, Vice Minister of Publicity in Tongcheng City, Anhui Province, said on May 25 that according to an investigation, approximately 45,000 coffins have been destroyed in the city, leaving only around 800 coffins scattered in peoples’ homes. During the coffin collection drive in Luting Village, Luting Township, on May 8, village committee staff sawed 83-year-old Mrs. Zheng Shifang’s coffin in half while she helplessly stood by and then fainted. After an attempted suicide by taking sleeping pills, Mrs. Zheng Shifang hanged herself in the utility room in her home in the early morning of May 23. A coffin registration was conducted door-to-door on April 18 in Chanchong Village of Dahuan Township in Tongcheng. That night, 81-year-old Mrs. Jiang Xiuhua hanged herself in the garden behind her house. Another woman in her eighties, Mrs. Zhang Wenying, also hanged herself. Her family said she did it because she was determined to “sleep in her coffin.” Village officials pressured the family to sign a statement, saying Mrs. Zhang’s death had nothing to do with the funeral reform, but the family refused to sign, according to a report by Oriental Morning Post. Mainland Chinese citizens don’t have the basic human rights most people on earth take for granted. From birth to death, the Chinese Communist Party dictates what Chinese people may do, say, and think. Translation by Cheryl Chen. Written in English by Gisela Sommer. The vast majority of organs available for transplants in China are seized by killing illegally imprisoned Falun Gong practitioners, human rights lawyer David Matas says. A new study says the lost jobs and decreased home values of the Great Recession lead to a spike in suicides, particularly among men.